Wade, I’m using a dewalt DWP849 [varbial- speed buffer], at what speed (rpm) should I use with the rejuvenator. The speed used will depend on several factors: your comfort level, type of finish, temperature and humidity. I typically run mine at 3500 RPMs. You will have several different finishes on your Coachman, paint, vinyl and color injected FRP. You will first need to identify these finishes. 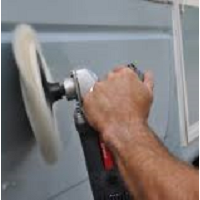 I would not buff out any vinyl and would use a low RPM when buffing painted surfaces. On FRP you will need to rev up your machine as high as you can comfortably go and slowly work the area until you have a shine. Hope this helps!